North Portugal Villa Holidays. Northern Portugal Villas. 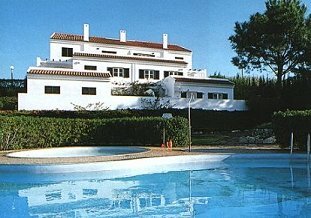 Holiday Villa Apartments in Northern Portugal approx 40 minutes drive North of Lisbon airport. Conveniently located near the major link roads to Northern Portugal and all the major sites of historical interest in North Portugal for your Holiday. Northern Portugal - VILLAS - CLICK HERE! Living in Portugal This holiday villa apartment is situated in a pleasant rural location, 40 minutes from Lisbon, enjoying panoramic views of the Obidos lagoon and the Atlantic Ocean beyond. It is only four miles from the holiday villas to the market town of Caldas da Rainha with its excellent choice of restaurants, bars and shopping facilities and the seaside town of Foz do Arelho is only a mile away. Nearby is the mediaeval town of Obidos and the Golf Course at Praia d'el Rey. The villa apartments offer a great deal of privacy and are designed to maximize the use of outdoor space and views. The villa apartments have a high standard of furnishings and decor. The villa apartments have well equipped fully fitted kitchens with washing machine and have satellite TV, Video and Stereos. North Portugal VILLAS - PRICE LIST - CLICK HERE!